Under the influence of the northeast monsoon, the weather was fine and dry with temperatures in the 18 -24⁰C range until the 7th. A surge of the monsoon from the 7th led to a decrease in temperature, with a range of 9 -18⁰C on the 9th in the New Territories. It was a birdy period with records from widespread locations of Ashy Drongos, Black-winged Cuckooshrikes, warblers (Yellow-browed, Pallas’s Leaf, Two-barred, Brown-flanked Bush, Japanese/Manchurian), flycatchers (Verditer, Asian Brown, Grey-headed Canary, Taiga, Mugimaki) and thrushes (Grey-backed, Japanese, Pale, White’s, Blue Rock). Tundra Bean Goose – two of the four birds first recorded on October 31 were still present until at least 8th. Greater White-fronted Goose – the three birds first recorded on October 31 were still present until at least 8th. Ferruginous Duck – two were at Lok Ma Chau on 6th. Oriental Stork – the bird first seen at Lok Ma Chau on November 27 remained until at least 6th. Eurasian Spoonbill – five were at Mai Po on 3rd. Black-faced Spoonbill – 111 were at the Wetland Park on 5th. Cinnamon Bittern – one was at Mai Po on 6th. Oriental Honey Buzzard – one flew over Cheung Chau on 8th; one was at Yi O on 10th. Hen Harrier – late news of one at Mai Po on November 4th, 9th &15th, identified belatedly from photographs. The first record for Hong Kong if accepted. Japanese Sparrowhawk – a male was at Long Valley on 7th. Eurasian Sparrowhawk – a female was at San Tin on 6th. Eastern Water Rail – one was at Pak Nai on 9th. Ruddy-breasted Crake - one was at Yi O on 10th. Northern Lapwing – two at Po Toi on 3rd were the first ever for the island. Twenty-six were at Mai Po on 6th. This is the highest count since an exceptional 126 at MPNR on November 26, 1992, although 24 were recorded there on December 14, 2005. Pheasant-tailed Jacana – two were at San Tin on 3rd & 7th. Eurasian Woodcock – one was on Cheung Chau on 3rd. Nordmann’s Greenshank – one was at the Mai Po boardwalk on 6th. Slender-billed Gull - one was seen on the Shenzhen side of Deep Bay on 10th. Should it stray to the Mai Po side of the water, it will be the 7th Hong Kong record. Pallas’s Gull – up to two were seen from the Mai Po boardwalk from 4th – 7th. Eurasian Hoopoe – one was at San Tin on 6th; one was at Po Toi on 7th. Bull-headed Shrike – singles were at Shek Kong catchwater on 1st and KFBG on 6th. Eastern Crowned Warbler – one was at Tai Po Kau on 7th; one was at Bride’s Pool on 9th. Sulphur-breasted Warbler – one was at Tai Po Kau on 8th. White-spectacled Warbler – one was photographed at Cheung Chau on 6th and may well be the Seicercus warbler that has been seen sporadically at the same site since October 30th and was thought to be a Bianchi’s Warbler; one was also at Tai Po Kau on 7th. Chestnut-crowned Warbler - one was at Lung Fu Shan on 7th. Baikal Bush Warbler – singles were in song at Mai Po on 7th and Yi O on 10th. Chestnut-flanked White-eye – one was at Bride’s Pool on 9th. Common Starling – one on Po Toi on 5th. Eyebrowed Thrush – one was at Tai Po Kau on 7th; one at KFBG on 6th. White-tailed Robin - a female was at Mai Po on 6th. Brown-breasted Flycatcher – one was at Tai Po Kau on 8th. Ultramarine Flycatcher – the bird first seen on November 29th at Shek Kong catchwater was present until at least 9th. Red-breasted Flycatcher – one was on Po Toi on 5th. Black Redstart – the bird present at Long Valley since October 29th was still present until at least 6th. Plumbeous Water Redstart – reports of two at Tai Wo on 3rd, and up to three at Bride’s Pool/Chung Mei on 6th & 7th. Grey Bush Chat – two were at Yi O on 10th. White Wagtail lugens – singles were at Ting Kok on 8th and Pak Nai on 9th. Common Rosefinch – one was at Yi O on 10th. Little Bunting – ten were at Yi O on 10th. Chestnut Bunting – two were at Yi O on 10th. The weather was generally cloudy and mild with temperatures in the low twenties. A resurgence of the northeast monsoon on 16th led to a low of 10⁰C in the New Territories on the morning of 17th. The Ultramarine Flycatcher was again seen at Shek Kong catchwater on 11th; also present there were Speckled Piculet, three Lesser Shortwings, Eyebrowed Thrush and Eastern Crowned Warbler. A Falcated Duck was at the Wetland Park. A Chinese Thrush found at Shing Mun on 12th and present again on the following day will be the 5th record for Hong Kong if accepted. Also on 5th a Black-backed Swamphen was seen at Hok Tau and Ho Man Tin held Bull-headed Shrike, Two-barred Warbler and Orange-headed Thrush. On 13th, Chestnut-crowned Warbler, Small Niltava, Verditer Flycatcher and Grey-headed Canary Flycatcher were reported from Lung Fu Shan. The warbler and the Grey-headed Canary Flycatcher were noted again on 16th. The White Spectacled Warbler was seen again in a large bird wave at Tai Po Kau on 14th. On 15th, the somewhat elusive Crested Kingfisher was found near Chung Mei by Matt Kwan and was in the same area on 16th, allowing a number of “younger” Hong Kong birders to finally catch up with this species. On 16th, a Dusky Thrush was seen at Pui O. This was probably the same bird as was seen on a HKBWS outing to the area on December 10th. The Black Redstart was at Long Valley, as was a Northern Lapwing. On 17th, three Plumbeous Water Redstarts were seen at Tai Wo, a Northern Lapwing was at San Tin and one of the adult Pallas’s Gulls was out on the mud flats at Mai Po. The lugens White Wagtail was at Pak Nai and a count of 54 Whimbrels was made at Sha Kiu near Tsim Bei Tsui – this is a high number for this species in winter. Best bird of the day, however, was a Rufous-faced Warbler discovered at Bride’s Pool by Kwan Tai-mun. This will be the 7th Hong Kong record if accepted, and the first since 2009. Early morning temperatures remained around 10⁰C until 22nd, although the sun shone during the day and temperatures rose to 17⁰C or higher. The 23rd was warmer, humid and polluted and the temperature on a sunny Christmas Eve ranged between 17⁰C and 24⁰C. The Rufous-faced Warbler remained at Bride’s Pool at least until 24th with a supporting cast in the bird wave that regularly included Chestnut-flanked White-eye, Verditer Flycatcher, Mugimaki Flycatcher and Goodson’s Leaf Warbler, as well as an Eastern Crowned Warbler on 23rd. Three Plumbeous Redstarts were also counted in the Bride’s Pool/ Chung Mei area on 19th and the Crested Kingfisher was seen on 18th & 19th. A male Small Niltava was at Lung Fu Shan from 18th -24th, and the Chestnut-crowned Warbler turned up again on 22nd & 23rd. The White-spectacled Warbler was seen again on Cheung Chau on 19th & 20th. A Eurasian Hoopoe was also on the island on 20th. The Oriental Stork remained at Lok Ma Chau at least until 20th and the eastern-race Rook was still present at Lut Chau on the same day. The three wintering Plumbeous Water Redstarts were still in the Tai Wo/Mui Shue Hang area on 19th and the Eurasian Hoopoe was seen again at San Tin on 23rd. Three unseasonal Whiskered Terns were also at San Tin on 23rd. The Wetland Park held good numbers of Black-faced Spoonbills during the period, with a high count of 134 on 22nd. Other sightings there included a Chinese Spot-billed Duck on 21st and a female Eurasian Sparrowhawk and a Eurasian Woodcock on 22nd. Other birds of note included a redheaded Smew at Mai Po on 21st and a Pallas’s Gull out on the mud flats on 23rd. A Slaty-backed Forktail was at Shing Mun on 23rd. A Barred Cuckoo Dove found near Shui Tsan Tin on 24th will be the ninth record of this species in Hong Kong if accepted. 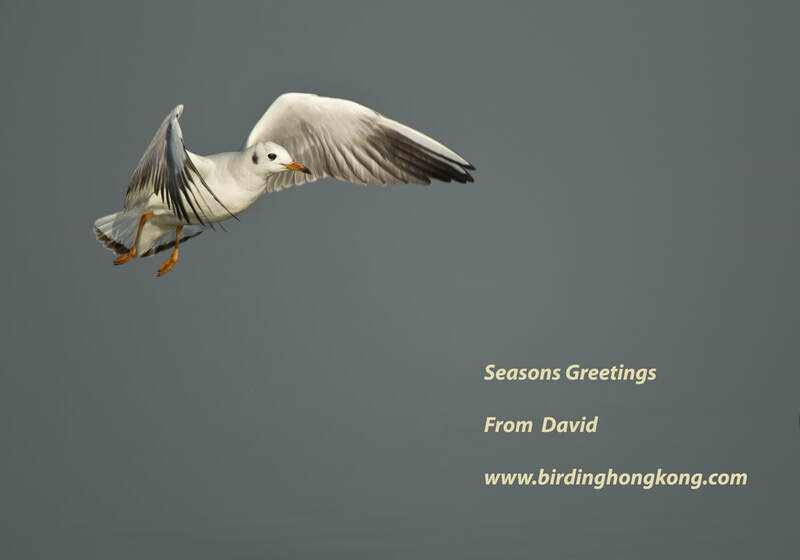 And finally, seasons greetings to all those who contribute to the birding scene here in Hong Kong and, of course, to those who visit this website! I wish you all a Happy Christmas and fruitful birding in the year to come. The year ended with generally fine and dry weather with temperatures up to 24⁰C on 29th and 30th. 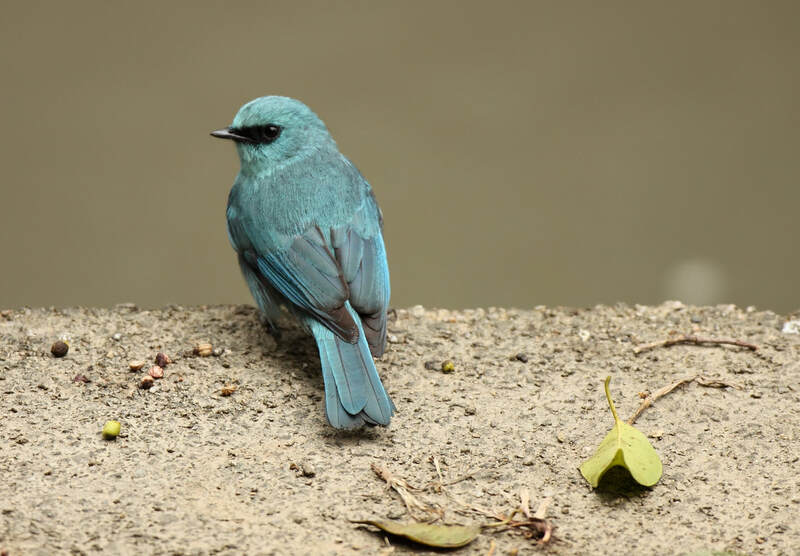 Long-staying birds that remained during the period under review included the Rook at Lut Chau, the Black Redstart at Long Valley and the White-spectacled Warbler at Tai Po Kau. The Small Niltava and the Chestnut-crowned Warbler continued to be reported from Lung Fu Shan. Sightings of note from Mai Po were the Smew on 25th, the Baikal Bush Warbler singing again in the same inaccessible reed bed on 29th and a Chiffchaff trapped and ringed by the HKBWS ringing group on 30th. Ng Tung Chai turned up a male Japanese Robin on 26th as well as a Eurasian Woodcock and a White’s Thrush, and on 30th two Rufous-gorgeted Flycatchers were found there by the same observer. A pair of Grey Bush Chats were at Wo Hop Shek on 29th. The Slaty-backed Forktail was seen again at Shing Mun on 30th.